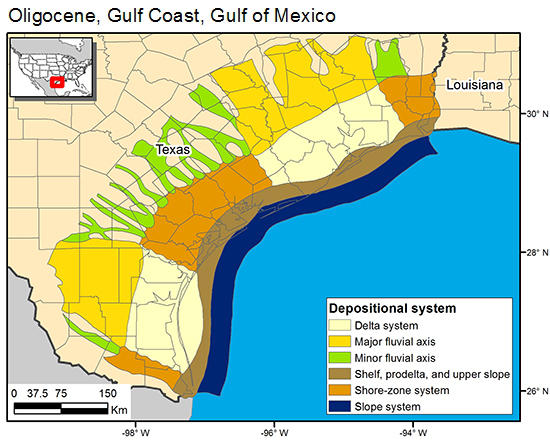 Compartmentalization is related to depositional facies and percent shale. A recent analysis of the south Texas Frio fluvial-deltaic play (Knox and others, 1996) provides a strong model for how to determine reservoir heterogeneity using facies and play analysis. Knox, P. R., Holtz, M. H., McRae, L. E., Hentz, T. F., Paine, J. G., White, W. G., and Chang, C.-Y., 1996, Revitalizing a mature oil play: strategies for finding and producing unrecovered oil in Frio fluvial-deltaic sandstone reservoirs of South Texas: The University of Texas at Austin, Bureau of Economic Geology, final report prepared for U.S. Department of Energy, Bartlesville Project Office, under contract no. DE-FC22-93BC14959, 178 p.